We have secured a broadcast deal with Sky Arts that will see the film aired on two prime time slots tied in with Record Store Day. Scheduled for Friday 19th April at 9pm and Saturday 20th April at 5pm. A new Deluxe edition of the DVD will be released at the same time. Beware – there are Deluxe editions and there are Deluxe editions! This is the real deal with an extra 74 minutes of footage including extended interviews with Johnny Marr, Richard Hawley, Billy Bragg and others, along with record shop owners telling funny anecdotes about life behind the record shop counter. None of this will be shown on the TV broadcast and is exclusive to the DVD. 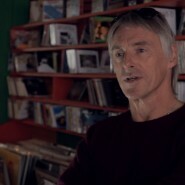 The physical DVD will be available initially only through independent record shops taking part in Record Store Day 2013. At the same time the Deluxe edition will be launched in Canada and the USA through our friends at Conveyor and MVD with the USA premiere being held across the country in independent record shops during the week before RSD. We have a special screening of the film at the famous Curzon Soho cinema at 6.30pm on the 18th April with an intro and QA with the filmmakers and special guests.